THE HAGUE — Among the unfinished business left by the death of Slobodan Milosevic is the central question of whether he was guilty, as charged, of genocide in Bosnia. But while his death brought a sudden end to his trial at the United Nations war crimes tribunal, the genocide issue may well be decided by another United Nations court based in The Hague: the International Court of Justice. That court, also known as the World Court, has recently finished nine weeks of hearings on a case filed 13 years ago, in the middle of the Bosnian war. With Muslim [Bosniak] villages under attack and civilians driven into detention camps, Bosnia's lawyers turned to the court, accusing Yugoslavia of violations "on all counts" of the United Nations Convention on Genocide. The case was held back by a slow-paced institution and by repeated legal moves by Belgrade to block the lawsuit. In the meantime, Yugoslavia became Serbia and Montenegro in 2003, and in May simply Serbia. Now, the hearings over, judges from 16 countries must give their interpretation of events from the 1992-1995 war. That is expected within the year. The terror campaign to clear non-Serbs from large swathes of Bosnia has become commonly known as "ethnic cleansing," but the line, if any, between ethnic cleansing and genocide has divided legal experts examining events from Bosnia to Iraq and Darfur. The World Court suit is unique in that it is not a criminal trial of individuals — like those at the tribunals for Yugoslavia, Rwanda or Sierra Leone — but rather a civil proceeding, in which for the first time one state is suing another charging genocide. The suit may well be the most complex in the 60-year history of the World Court, the United Nations' highest, which usually deals with issues of sovereignty, diplomatic relations, and land or sea boundaries. "This will give new relevance to a court that was sidelined by the new war crimes tribunals," said Antoine Garapon, director of the Institute for Advanced Legal Studies in Paris. "It may ultimately pass a historic judgment on Milosevic and his regime, even if that was not its function." Should the court rule in Bosnia's favor, the Serbian state will suffer the stigma of having committed genocide, an outcome that would implicate the entire Milosevic government. For Serbian citizens and their fledgling economy, that could mean also being saddled with hefty war reparations. 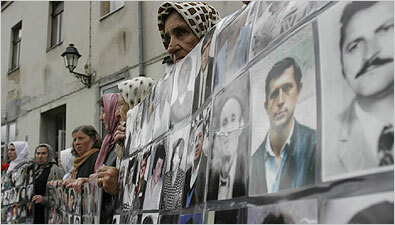 Bosnia has asked the court to award damages for the loss of life and property. During the war, 100,000 people died, the majority of them Muslims, and entire Muslim towns and villages were destroyed, including their mosques and monuments. No figure was set. Serbia has argued that there were local excesses of war but no genocidal campaign, that Belgrade did not control events in Bosnia and that a verdict favoring Bosnia will make reconciliation between the neighbors even more difficult. Bosnia says the opposite, and argues it needs "recognition of Serb guilt" even more than reparations. Even at this late stage, Serbia has raised new obstacles, challenging once more the jurisdiction of the court. It argued that during the relevant period, Yugoslavia was not a member of the United Nations and, by extension, not a party to the court. In the past, judges twice ruled the court had jurisdiction. In the recent hearings, the opposing legal teams made ample use of documents, evidence and even witnesses from trials at the war crimes tribunal, which sits a few miles away. The tribunal found genocide at Srebrenica in 1995, when more than 7,000 Muslim men and boys were executed. But at least one crucial cache of material has remained out of reach. The wartime records of the Supreme Defense Council, which included Yugoslavia's military and political leaders, were handed to the tribunal after much Western pressure. But Belgrade secured the guarantee that they be accessible only to the court's judges and lawyers. Belgrade officials claimed national security, but some have made it no secret they wanted to keep the records out of the hands of the Bosnians suing them at the World Court. Tribunal officials familiar with the secret archives said the minutes of the meetings revealed much about how Belgrade ran the war in Bosnia. "Of course people may say things differently if they know they are recorded," one official said, requesting anonymity because he lacked permission to speak to reporters. "Milosevic was also known to convey important decisions in private." Parts of the minutes were missing, he said. During Mr. Milosevic's trial, prosecutors said the archives provided the best records and insights into his real power and his state of mind. Human rights lawyers have insisted that opening the archives is necessary for Serbia to be confronted with its wartime history. For now, Bosnia must demonstrate that Serbia not only supplied but also controlled the troops that were involved in eradicating Muslim communities — including Bosnian Serb troops and Belgrade's own special forces and militias. Gen. Ratko Mladic, the Bosnian Serb military commander wanted for genocide by the war crimes tribunal, traveled to Belgrade almost weekly during the war, according to testimony from NATO commanders. Legally proving genocide requires showing intent to destroy a group, in whole or in part. Phon van den Biesen, of the Bosnian team, said that intent was evident in this case from the pattern of crimes on the ground, including the destruction of close to 1,000 mosques, so evidence from the archives would not be needed. Lawyers following the case said defining genocide or proving it at this court might be different. "This is not a criminal trial and the levels of proof needed are not as high," said Richard Dicker, a director of Human Rights Watch. "In any case, it will be hugely important to see how this court interprets and rules on genocide."